What Are the Benefits of Egg Yolks? Eggs have three separate sections -- the shell, the white and the yolk. When you crack open a raw egg, the yolk is the yellow, circular section; a growing embryo feeds off this part of the egg as it grows within the protective shell. 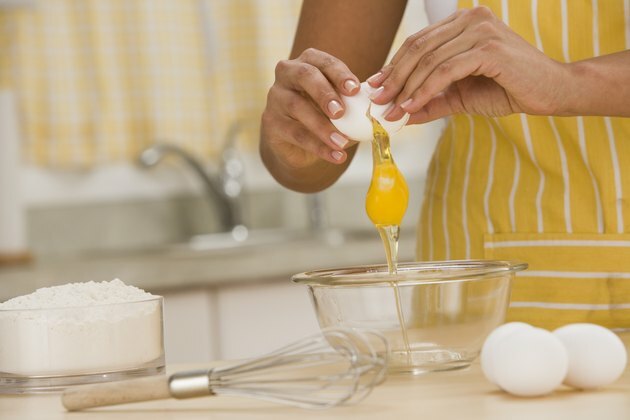 While the health benefits of egg whites are widely known, egg yolks have health benefits, too. Egg yolks contain more vitamins -- and larger quantities of those vitamins -- than egg whites. Each egg yolk contains seven vitamins: B6, folate, a B vitamin, B-12, A, D, E and K. Of those, vitamins A, D, E and K are found only in egg yolks and not in egg whites. In fact, egg yolks are one of only a handful of foods in which vitamin D is naturally found. Like vitamins, minerals are crucial nutritional building blocks, essential for carrying out body functions like balancing electrolytes. Egg yolks -- and egg whites -- each have 13 varieties of minerals. These minerals include calcium, magnesium, iron, potassium, sodium and selenium. Although both the egg white and egg yolk contain these minerals, the yolk has larger amounts of most. For example, 90 percent of an egg's calcium is in its yolk; 93 percent of its iron content is in the yolk, with just 7 percent in the white. Carotenoids in egg yolk -- particularly the carotenoids lutein and zeaxanthin -- show promise for promoting eye health. These carotenoids, which are colorful pigments that give egg yolks their yellow color, lower the risk of age-related macular degeneration and cataracts, according to researchers. They act as antioxidants in the eye, protecting it from free radicals that can damage different parts of the retina, impacting its ability to correctly focus light. Egg yolks -- and the vitamins, minerals and other nutrients found within them -- also help promote heart and cardiovascular health. Not only does the moderate consumption of egg yolks not show a direct connection to heart disease, but nutrients in the yolk -- such as choline -- help to regulate cardiovascular function. Additionally, a study by the University of North Carolina at Chapel Hill found women with the highest level of choline intake were 24 percent less likely than women who got the least choline in their diets to develop breast cancer. Egg yolks contain cholesterol, so you should limit the number of eggs you eat each day. Depending on your overall health or risk for heart attack, your doctor may recommend avoiding egg yolks or using them sparingly in your diet. Will Hard-Boiled Eggs Help You Lose Weight?